Around three years passed since we tested TLK TWS-096054-M-GY antivandal cabinet, which pleasantly surprised us with its quality: neat weld seams, powder coating, and a safe-like door. Today our laboratory hosts a new model of antivandal cabinet by the same brand, TWS-156054-M-GY. In this review we will try to gain an insight into how well the cabinet performs in comparison with the previous model. Okay, let's get started. TWS-156054-M-GY antivandal full-metal welded cabinet is significantly bigger than the previous model and provides room for secure placement of telecommunication equipment of up to 15U high. The case has dimensions of 600х540х747 mm and weights more than 56 kilograms. It is carried using detachable metal handles that are screwed in the case. The door, which is all doubled, is now buried deeper into the case. Between the two metal sheets there's a lever lock with four deadbolts. The box includes user manual, eight rubber plugs for cable entries, carrying handles, six anchor bolts for mounting the device on the wall, and four keys. It'd be fair to mention that we were testing a pre-production prototype of the case and it was fitted with a different lock than the production sample would be. The final customer will be offered the product with a lock whose deadbolts have a heat-treated piece inside of them, this way protecting it from sawing through the bolts. In order to avoid moisture entering the case rubber plugs may be installed on the cable entries that are not used. One can also minimize the quantity of liquid entering the case using the same plugs of various diameter: the user will need to cut out a snug-fit hole in the rubber plug before putting the cable in. However, we think that if the cable entries had been angled, it would have helped to protect the equipment located inside better. The cable entries are reinforced with welded rings made of the same material as the case. Inside of the case there are four mounting strips that can be adjusted by depth, which lets the user install equipment of various depth. All metal elements in the case are interconnected to the same circuit using ground leads. The rear wall of the case has six mounting holes fortified with plates for wall mounting. We happened to test a pre-production prototype of the product and that's why not all seams were completely welded. The vendor promised that the production sample wouldn't have this kind of poorly welded seams. One may use active ventilation inside of the case as its side walls have ventilating holes with an area where the fan is supposed to be mounted. The ventilating holes are protected by metal plates that help avoid moisture entering the case. On the inside of the case the ventilation holes are covered with a metal grill which is meant to protect it from vandals that may try to stick something inside and crack the case. Another new thing that the model is fitted with is a door sensor that informs the user about the position of the case door. That is where we bring review of the external design of the case under review to a conclusion and pass directly on to testing it. We would like to make a few comments before starting to stress-test TLK TWS-156054-M-GY vandal-proof case. Firstly, we will only test its mechanical durability; in other words, we will not make any conclusions about, say, the durability of the metal, plastic, rubber, and paint to any kind of temperature or chemical exposure. Secondly, we disregarded reviewing the lock mechanism reliability when it comes to lockpicking since we only tried to open it using brute force. Thirdly, we didn't check the performability of the door sensor because we thought that a structural part as simple as this would perform its functions flawlessly in any case. Apart from it, we used the experience we received during the test of the previous model: we didn't cut the case walls through since we thought that we would be able to do that anyway because there are no reinforcing elements located on them. Instead of it we focused our effort on several key areas and stopped only when we were able to easily cut through the case. We have chosen the following tools: a bolt cutter, crowbar, hacksaw, angle grinder, and pick. The two latter tools make quite a lot of noise and that's why we tried not to use them too much. Recently retailers started to sell very powerful battery angle grinders and we cannot simply leave out this tool. Obviously, a common vandal will not purchase and use them, but a professional burglar will be glad to give them a try. The first thing we decided to begin our stress testing with was the area of cable entries, which were reinforced with special rings/tubes in this model. Unfortunately, the reinforcing element is fastened to the case only in two spots, which allows one to use a crowbar to crack it. Since the reinforcing elements are made of the same metal as the case, it wasn't too difficult to cut it using our bolt cutter and then simply continue cutting the whole thing overpassing the case edge. The ventilation holes became the second most important thing we decided to focus on. That's right, in this model they are covered with metal blinds that help avoid water entering the case, but they won't be too much of a problem when it comes to cutting them with nail puller and bolt cutter. It'd fair to mention that the seams are welded really well and we couldn't tear the seam using the nail puller like we could while testing similar equipment produced by competitors. The picture above shows that there's a small metal tube located inside of the case. This structure element is used to fasten the carrying handle to the case. Unfortunately, the tube is located too close to the upper edge of the case, which allows one to begin cutting the case from it. The photo below shows two attempts at beginning to make a cut. The first cut, which you can see on the left part of the photo, was unsuccessful. We tried to begin cutting by simply using the bolt cutter on the edge of the case. The second cut, which you can see on the right part of the photo, was made with a hacksaw. The small corner part which we were able to cut in a few minutes allowed us not only to begin making a new cut but also understand how everything was placed inside of the antivandal cabinet. There was another tooling hole, the keyhole, that we simply could not but to test. We began cutting from it and managed to successfully cut the door open and access the lock case. The lock turned out to be dismountable, which significantly facilitated the door opening procedure. It'd be fair to mention that after opening the case door the burglars will face a very unpleasant surprise: the door sensor that limits the time of access to the equipment located inside of the case. Finally, we decided to skip directly to less humane cracking methods. One can open the door using an angle grinder really quickly since the deadbolts are only fastened to one side of the case that doesn't have reinforcing elements. Obviously, in this case the door sensor will be triggered too. 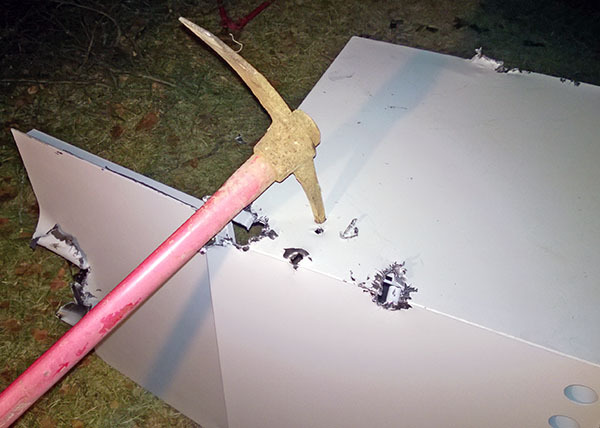 Usage of an angle grinder with a large disk allows one not only cut the side panel in the way as it is show on the photo below, but also cut through the door material and the deadbolts at the same time. The production prototype we were sent had common full-metal deadbolts. 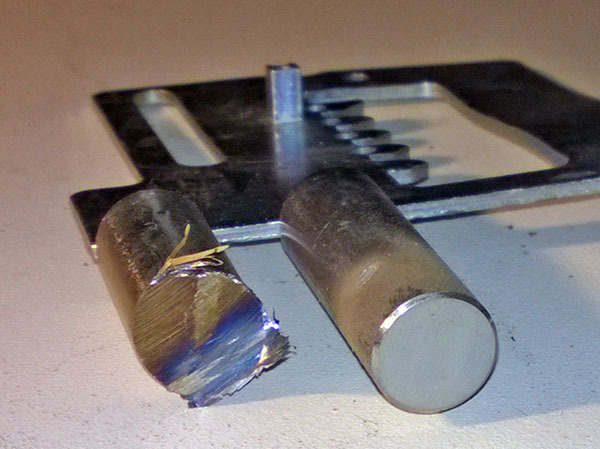 However, the vendor claims that it is going to fit all production samples with locks whose deadbolts will have rotating cores, which will either make it significantly more difficult to cut them through using an angle grinder or simply make it impossible. But if the burglars would use the angle grinder with a large disk, it will be possible to cut through the internal elements of the lock itself. And though there actually wasn't any necessity in doing that, we just couldn't help but use the pick. One can see the tool and the results of its performance on the photo below. The pick may be used for making another hole in the case that would become a starting point for the cut. 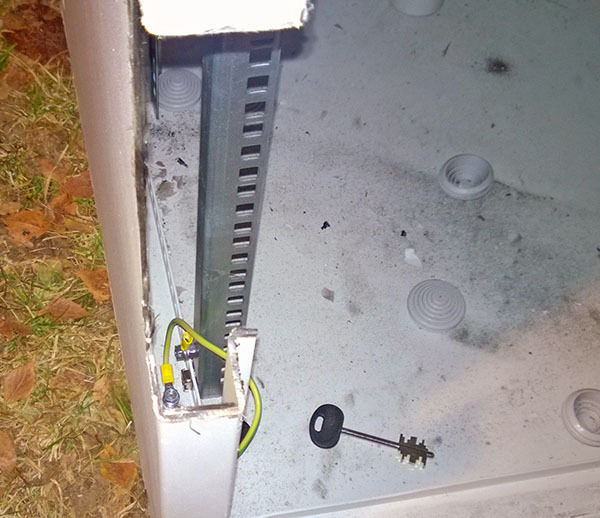 It also would be fair to notice that even if we applied a lot of force, the tool didn't enter too deep into the case and the hole was just several centimetres deep, which wouldn't let burglars destroy the equipment. A single strike, which obviously will be quite loud, might happen not to attract attention of the neighbors, which will allow the burglars to use other tools that don't make so much noise. Irrespective of what kind of passive elements are used for protection of telecommunication equipment, we believe that one cannot do without active protection. One of such active protection methods is the door sensor that TLK TWS-156054-M-GY antivandal cabinet is fitted with. Exactly like the previous time, we remain pleased with the manufacturing quality of the case and the materials it's made of. We believe that not all new structure elements turned out to be useful, but anyway the work done by the vendor was not in vain. Irrespective of the case durability, we would like to recommend service providers and other companies that use antivandal cabinets for their equipment to use combined protection methods (both passive and active) that allow one not only to prevent the burglars from cracking the case but also inform the company's security services about any physical intrusions into their property. External design of TLK APTWS-156054-M-GY antivandal cabinet makes it possible to place it in public spots too: shopping centres, hotels, underground parkings, and so on, which allows broadening its application area and go beyond the service providers' POPs. Also, we provide you with a short video of the cracking process. As of when this article was being written, the recommended price for TLK APTWS-156054-M-GY model was 11,255 roubles. The author and editorial team are grateful to Artyom Ustinov and Aleksandr Mukhin for their invaluable help in preparation and carrying out of the tests and Tayle Company for kindly furnishing us with the the case.